Let the cookie making begin! I should've blogged this last night, but I went to bed at 7:30... yeah...7:30. 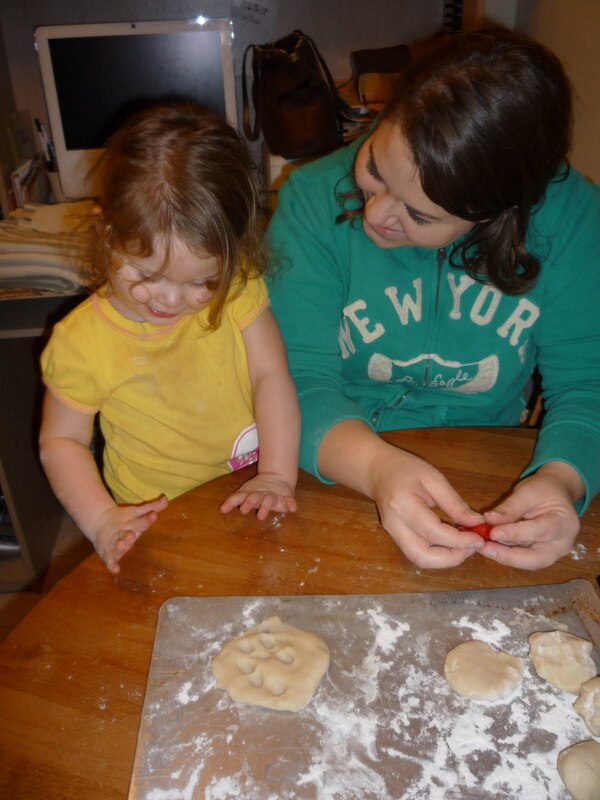 Sunday night we headed down to the Stauffer's for an impromtu dinner and cookie making. We attempted to make turkeys. They tasted better than they looked. Yesterday, I took Zoe with me to the mall to pick up some Christmas gifts and we happened to enter the part of the mall, right where Santa Claus was sitting. 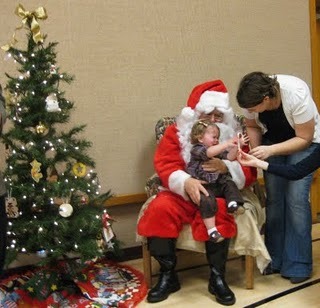 This was last year's visit with Santa at the Church Christmas Party. This year, everytime I've asked Zoe if she's excited to see Santa, or have Santa come to our house, the reponse is a quick, "NO!" So, I proceeded with caution. We looked at the huge tree and then she spotted him. He started to wave and she waved back, with big eyes and a mouth wide open in awe. She didn't want to go sit on his lap, or even talk to him, but at least there was no screaming. Maybe we can get a decent picture this year....probably not though. It's been cold and rainy the past few days, which I love. It's quickly made me realize we definitely need to invest in some warmer clothes for the whole family, since this is just a fraction of the cold that we'll be experiencing soon. Hope you're all having a wonderful Thanksgiving week and staying dry and warm. PS. If you're the praying kind, could you add my Mom and Sister to your prayers? They are attempting to make their way from Montana to Utah in the next couple days in the middle of a blizzard warning. Extra prayers can't hurt. I think we all have those awful Santa pictures, right?!! Hopefully this year is much, much better! Praying for your family too. Hugs. Will do on the prayers for your family! I will say some prayers for your family! I hope they make it safely!! I will definitely pray! I think the cookies are cute, I'd eat em!